Kiwanis Club of Acadiana | Kiwanis is a global organization of volunteers dedicated to improving the world – one child and one community at a time. 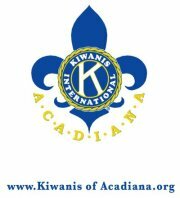 Welcome to the Kiwanis Club of Acadiana! The Kiwanis of Acadiana has been active in the Lafayette, Louisiana community since 1983 through service events, fundraisers, and fellowship. We are a group of men and women ranging from young professionals to retirees who have a passion for serving the children of the world and Acadiana. Explore our site or join us for a meeting on Thursdays at noon at Don’s Downtown.